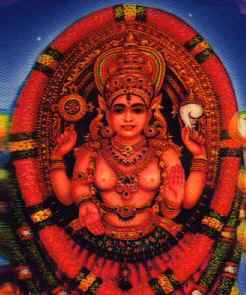 Chottanikkara enshrines Bhagawati - the mother Goddess, one of the most popular deities in Kerala. The town of Chotanikkara is located near the city of Ernakulam. Enroute is the Poornatrayesa temple at Tripunittura. The Deity: Rajarajeswari is the presiding deity here. The image of Bhagawati (Rajarajeswari) is of laterite; untouched by the human sculptor, this image is of irregular shape. and is covered with a golden kavacam. The image has four arms. The upper right holds the discus, the left a conch. This deity is worshipped in three different forms - as Saraswati in the morning - draped in white, as Bhadrakali at noon draped in crimson, and as Durga in the evening decked in blue. Adjacent to this image in the sanctum is an image of Vishnu in granite. Vishnu and Bhagawati together are referred to as Lakshminarayana. The prayers here address the deity as Amme Narayana, Devi Narayana and Lakshmi Narayana. Interestingly, the image here is not fixed to the ground and is mounted on loose sand. Water offered during ablution ceremonies percolates underground. There is also a shrine to Sastha depicting him with his consorts Purna and Pushkala. In front of the shrine are the flagstaff and the bali pitham. To the south is a platform known as Pavazhamallithara where the deity is believed to have appeared first. To the south west is a shrine to Shiva. To the north east there is a flight of steps leading to the Keezhkaavu, a shrine to Bhadrakali. In the keezhkaavu shrine is a paala tree with hundreds of nails driven into its trunk, as a mark of devotees having been exorcised here. Worship here is believed to rid devotees of evil influences, psychological ailments, evil spirits etc. Much of the structure in this temple is a result of renovation carried out by the government of Cochin, in late 19th century. Legend has it that a ferocious dacoit by name Kannappan who dominated this area, brought home a cow with the intent of slaughtering it. The cow escaped his butchering knife, and set him running in hot pursuit. His chase in vain, Kannappan returned home to find his beloved daughter playing with the very same cow. Complying with her request, he forsake the idea of killing the cow. His daughter passed away, and this greatly grieved him. Goddess Bhagawati appeared in his dream, and revealed to him that it was she who had come to him in the form of a cow. To his surprise, he saw two images in the cowshed the following day; the images were those of Devi and Vishnu. Kannappan built a humble shrine and worshipped the images in the cowshed. Eventually this shrine fell under repair and was discovered later and sanctified. It then grew into a shrine of the magnitude seen today, over a period of time. The annual festival here is celebrated in the month of Kumbha or Aquarius (Feb - Mar). Maasi Makam, coinciding with the full moon, during this festival attracts vast crowds. Legend has it that the deity appeared in front of Vilvamangalam Swamigal a saint associated with this shrine and with Guruvayur. Vilvamangalam Swamy is said to have discovered Bhadrakali enshrined in Keezhkaavu.